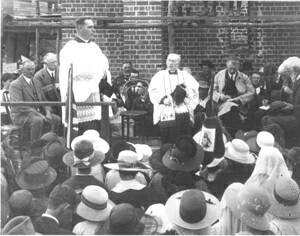 What was undoubtedly the culmination of a great endeavour in Church work was witnessed last Sunday by the people of the antique and pretty seaside town of Bunbury, when his Grace Archbishop Clune blessed and opened the beautiful and commodious church which will henceforth be known as St. Patrick’s, Bunbury. What was undoubtedly the culmination of a great endeavour in Church work was witnessed last Sunday by the people of the antique and pretty seaside town of Bunbury, when his Grace Archbishop Clune blessed and opened the beautiful and commodious church which will henceforth be known as St. Patrick’s, Bunbury. It is unquestionably a wonderful work worthy of the best days of Faith, alike glorious to the fidelity of the community who raised it, and a remarkable memorial to the foresight, zeal and courageous optimism and faith of the priestly genius that planned it and gave it completed form. For generations to come it will last an abiding memory of the energy and zeal of Archdeacon Smyth’s pastorate, and it will be positive evidence of the spiritual triumph of Catholicity in the South-West and its material progress. Raised up in its splendour on a hill overlooking the town, it is a veritable giant among the churches of the other denominations, and is easily the most striking landmark noticeable for miles and miles around, and may be easily seen by the mariner far out at sea. On the run down from Perth there is no occasion to ask where is St. Patrick’s? Its substantial tower and its well defined cross-crowned gables, its great brown roof, answers the question. St. Patrick’s looks down upon the quiet old seaside town like a benign friend, and when in years to come Bunbury has come into its own, and is recognised as one of the great water places of this State, it will stand erect and splendid upon its hill an evidence of Catholic faith in the stability of the South-West. Not only then is it a great reminder of spiritual progress achieved through the wonderful Gospel of Christ, but it also enunciates the importance of a courageous reliance on the future material values of the district. It is a sufficient answer to those indiscreet and anonymous critics who occasionally fling their brick-bats at Catholics and charge them with being enemies of the state, because it represents in hard cash, the contributions of a by no means wealthy community, the loyalty and fidelity of Catholic citizenship. “Money talks” is a much-used sporting phrase, which is well worth remembering by the self-appointed critics of the Catholic Church. The thousands spent in the erection of the stately God’s House dedicated by the Archbishop at Bunbury last Sunday, under the patronage of St. Patrick, the patron Saint of the Irish race, to the worship of the Almighty, should give a good solar-plexus blow to any local antagonism that might be prevalent in the neighbourhood against Catholics. There is not a little, we understand. It is mostly the outcome of jealousy and pique, and an insufficiency of human wisdom and knowledge. All the local churches, however, bear Saints’ names, and the Cathedral aspect and importance of St. Patrick’s, we have no doubt, will in time convert the malcontents to a better understanding of the virtues of the Catholic Church and its great Christian Charity. The vast congregation filled to the doors every inch of space in the great building; the aisles were even crowded; the event was indeed a memorable and historic one. It will be a tradition for the Catholic people of the parish who witnessed to hand down to the next generation, and will be remembered with pride, when, at a later day, in the providence of God, St. Patrick’s will be raised to the dignity of an Episcopal Church. People came from Waterloo, Dardanup, Ferguson, Brunswick and Australind. Every portion of the vast district was represented. In the large congregation many representative non-Catholics were present to show their testimony of goodwill to the Catholic community and to its well-loved leader in the person of Archbishop Clune. Amongst the congregation were Messrs. Money, M.L.A. (representative of the district), and Rose, M.L.C., and many of the municipal councillors. Prior to the opening ceremony, and early Mass was celebrated in the new church, and a large number approached the Holy Table. Up to a late hour on Sunday night Archdeacon Smyth, and Father Dunne, of the Cathedral staff, were busy in the confessionals. A large number of candidates for Confirmation were among the Communicants, and the first Mass was an inspiring example of Catholic Faith in the Real Presence, and assuredly consoling to his Grace and Archdeacon Smyth. 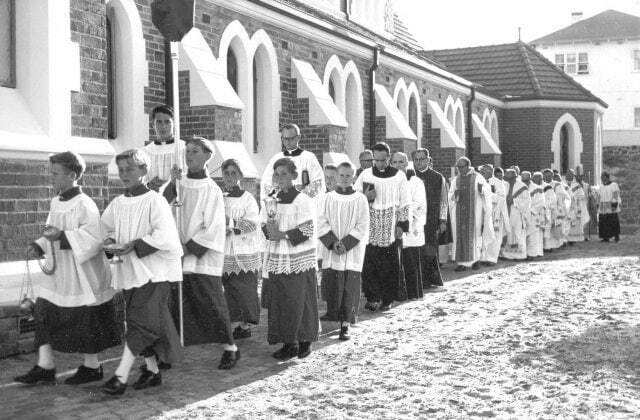 At half-past ten o’clock, punctually, his Grace, in cope and mitre and pastoral staff, preceded by acolytes and cross bearer, attended by Fathers Dunne, B.A., and W. Lyons (Dardanup), with Archdeacon Smyth as Master of Ceremonies, began the official blessing and opening ceremony. The Hibernians formed a guard of honour to his Grace, and a strong representation of the Children of Mary and members of the Sacred Heart Sodality joined in the procession around the church. The music of the grand old hymns, “Faith of Our Fathers,” “Nearer My God to Thee,” and “Hail Holy Patrick,” were well rendered by the parish brass band, and a great choir of voices made the strains ring out with great fervour-the effect was devotional and very beautiful. The ceremony of blessing and dedication having been completed a Missa cantata was celebrated by Father J. Dunne, B.A. After the Gospel, from the pulpit, Archdeacon Smyth, by way of introduction and explanation, said he was exceedingly gratified with all that had happened that day. The weather was superb, thank God. The dedication ceremony so much yearned for was as solemn as the rubrics allowed-and that was much. The full audience crowding the great edifice in every part and outside was a record and he felt sure that hundreds of the audience thrilled with the highest emotions of gladness, gratitude, and perhaps complacency. He welcomed them all-no matter what their religious susceptibilities-for the True Church encircled the world, and that material miniature in…(line missing from original)…grandeur of space and grace which was such a striking feature of God’s Kingdom on earth. Many would like to know how they, a very poor community, managed to collect so much money and raise up such costly and imposing structures to the glory of God. Sincere faith in our God-created Church and its Divine Mission and generously-minded hearts and hands give the answer. A few years ago we began at scratch-no land, no credit, and not much hope! Yet within a few fleeting years we have spent almost £20,000 in buying, clearing, levelling and building, and today we owe a very big sum, almost as much as the City Council owes-and yet we fear it not-we owe about £5,000. But we have something to show for it. Everybody admires our picturesque site, and our glorious buildings are, or ought to be, the glory and pride of our people throughout the whole immense domain of the South-West. But all this work was not done without trouble. There were worries, risks, and disappointments. At times I had to battle through a hurricane of unjust and criminal criticism. But destructive criticism is a criterion of success, and I mention it not by way of complaint, but in order to emphasise my deep gratitude and appreciation of the many who loyally and valiantly stood by me in the various and trying vicissitudes of war and peace, and helped me to the consummation of today, and my last words are words of welcome in my own behalf and yours to our Archbishop. It would be easy to write an address of welcome and to frame it in the fantastic hyperbole so characteristic of the age, but when I tell him in this House of God that our welcome is warm and rich, he will feel himself welcomed and honoured on this special occasion in our midst today. He cannot but feel pleased to see this temple raised to the glory of God, and be happy in dedicating it for all time as God’s dwelling place. Taking his text from the Gospel of St. John, 12 chap., 4 and 5 verse- “Then one of his disciples, Judas Iscariot, he that was about to betray Him, said: ‘Why was not this ointment sold for three hundred pence, and given to the poor?’”-his Grace said: The occasion on which this conversation was uttered was at a supper when Mary Magdalen took a box of ointment of great price and anointed Christ’s feet. The loving act of Mary Magdalen shown to our Divine Lord brought the reproachful words of the false disciple upon her, just as the efforts on the part of Catholics to honour God in the Blessed Sacrament by building beautiful churches in which He would dwell in the Tabernacle on the altar are made a matter for criticism and reproach. The Cathedrals and churches which studded every land stand as monuments to the faith and love of the people and their belief in His Sacramental Presence on the altar. Critics asked: Why this lavish display? Why this waste of money-could it not be put to better purpose and given to help the indigent, the sick and the poor? Those who ask these questions, continued his Grace, forgot two things, one of which was that the people who are most generous to God could not, and would not, be remiss in other things, and that those who contribute to church buildings are never forgetful of the poor. The building of their great church was the transformation of faith into material form. They should take to heart what Our Lord said was the greatest and the first Commandment. “Thou shalt love the Lord thy God, with all thy heart and with all thy strength,” and the great duty of the Catholic is to follow out this great Commandment. The motive of building their great temples did not rise from vain display. It was the outcome of the vivid zeal of priests and people, and all that is meant by the great First Commandment of Our Lord, that what is richest and most beautiful alone is worthy of the service of God. His Grace dwelt upon the wealth and energy and artistic effort spent in building material shrines raised for the gratification of human vanity, and compared the motives at the back of these with the spirit which prompted the efforts of the people of Bunbury to erect a shrine worthy of the Eternal God. To build a temple worthy of the Most High, Solomon had a desire to lay all the nations under tribute, and all that was splendid in art and science was brought into his service to beautify and make great that temple, and it was his prayer that the Lord of Hosts might find it a fitting habitation. “I have heard thy prayer and thy supplication,” said the Most High, “and my heart is there always.” The Church of God is the habitation of the Lord, for “The Lord loveth the gates of Zion more than all the places of men.” With beautiful words his Grace paralleled the great graces with which the Most High adorned the Mother of God with the richness and splendour of the temples raised by Catholic piety, wherein is to dwell the Redeemer of men. It is written in the Book of Proverbs, “The Lord preserved me in the beginning of His ways.” From the beginning the Creator meant Mary to be the most perfect of His creatures. All the great graces this most radiant among woman received from God was typified in her transcendent beauty and perfectness. She was so adorned by the Almighty because she was to be the Mother of the Redeemer. Through her the curse of Adam’s transgression was to be lifted off man, and the vision of the Redemption was made clear by the unsullied beauty of that sinless soul- “Our tainted nature’s solitary boast.” She is called “The Lily of the Valley,” and it is the proudest tribute that has been paid to that living shrine of Almighty God. Never was a creature born with such great graces as Mary, the Mother of Christ. We may ask why such lavish adornment on one creature? “Because He that had made me rested in my House.” And that is the reason why Catholics spend so much in the building and adornment of their churches, because in the Catholic Church, which is the House of…(line missing from original)…on the altar. There in the Blessed Sacrament the Heart of Jesus is as warm and active as when Christ was with His apostles on the way to Emmaus. Christ’s presence in the Blessed Sacrament gives to the Catholic Church its sacredness. That it is a house dedicated to God, and that God dwells in it he need not prove to Catholics, because it is a truth they know. Just as Jesus took up His abode in Mary’s chaste womb, so He does on the altar during the celebration of Mass, and the graces given to Mary will be given to the children of the Church by the Sacraments-sin will be washed away by the healing hands of Jesus Our Lord in the Sanctuary. At the altar the marriage tie will be blessed, and from the tabernacle when death comes our Divine Lord will go forth to strengthen the soul and temper its agony for the passage to eternity. All this explains the sacrifices Catholics are ready to make for their Faith. Concluding, his Grace referred to the inconvenience to the people and Sisters by having Mass in the school. The accommodation was insufficient to meet the needs of the faithful, and now that they had such a beautiful temple in which to give fitting worship to Almighty God, he felt sure they would contribute generously towards lessening the debt that remained upon the building. His Grace paid a rich tribute to the Archdeacon’s enterprise and clear vision as to the future. He could not sufficiently extol his wonderful achievement in the erection and completion of their great temple. It had been said that the Catholic Church in this country is subsidised by assistance received from over the seas. When it is remembered all that the Church has done for the amelioration of poverty in war-riven Europe, and the help she had given the starving people of Russia from her poor treasury, carping criticism would be silenced in regard to those outside aids. Catholics had no rich resources abroad. The Archdeacon had to depend on his own faithful people of Bunbury and on Bunbury alone, and the glory of raising such a beautiful temple to the honour and glory of God belongs to the Archdeacon and his people. He congratulated them on the crowning of the work that has been done for the greater glory of God and the salvation of souls. Their beautiful church would stand as the concrete expression and symbol of the zeal of priests and people for the faith and their belief in Almighty God. It would stand for generations unmindful of the buffets and storms that would beat against it a living testimony of the warmth and generosity of the faith of the people of Bunbury. His Grace thanked the Archdeacon and people for the welcome they had given him. The function that had taken place that day was one of the grandest in his experience as Archbishop. He hoped that in a few years the zeal of the Archdeacon would be recognised, and that he would be able to say that every penny was paid off. Archdeacon Smyth read a long list of contributions received. At the close a collection was taken up, and the response was very generous. The appointments of the church are in keeping with the beauty of St. Patrick’s. The Stations of the Cross, the gift of Mr. and the late Mrs. J. A. Boor, are artistically wrought representations of the Way of Sorrow to Calvary. They are in high relief, and cost 100 guineas. An excellent choir, under the baton of Mr. Power, sang Turner’s Mass of St Cecelia. Messrs. Connolly (bass), Fitzpatrick (tenor), Miss Hastie (soprano), and Mrs. C. Boswell (contralto) had the leading parts. The “Kyrie,” from Mozart’s Twelfth Mass, was devotionally and effectively rendered. Miss Hastie’s “Ave Marie” was sweetly and devotionally given. The music was worthy of the great occasion. Miss Aileen Rooney and Mr. Carl Meyer (violins), and Mr. Len Nesbit (cornet) rendered valuable service to the choir. Miss Josie Boswell presided at the organ. At 4 o’clock in the afternoon, his Grace administered the Sacrament of Confirmation to a large number of candidates, amongst them being several adults. The church was thronged. Prior to the ceremony Archdeacon Smyth explained to the candidates the importance and necessity of the great Sacrament to be conferred, and the reasons why it was incumbent on the candidate to be well instructed in the truths of religion before the reception of the Sacrament, that they may be worthy of the supernatural dignity which it conferred. His Grace was attended by Father Dunne, M.A., and Father W. Lyons. During the ceremony the choir beautifully…(line missing from original)…make their profession of Faith were told by his Grace its meaning-that it was a repetition of the profession made by their sponsors at baptism, and that they having come to the age of reason, would now make it for themselves in a public manner. As Catholics they would openly and unreservedly practice the principles of their Holy Faith. The grace received in Confirmation would help them to fight against the temptations they would experience when they went into the world. The candidates with great fervour recited the Lord’s Prayer, the Hail Mary, and the Apostles Creed. The usual promise to abstain from intoxicating liquors until the age of 21 was made. His Grace referred to the pie-bald prohibition that is at present being attempted in order to put down intemperance. Some people would be beggared at the expense of others. It would be ineffectual to achieve its object. The Catholic Church was doing more than any other body to combat the evil of intemperance, and was doing its work effectively and without noise. He was very pleased with this large number of candidates presented, and he again congratulated the Archdeacon on having accomplished in a short time what no other priest could have done. His Grace then imparted the Papal Blessing. So ended a most interesting day’s history in the life of Bunbury. 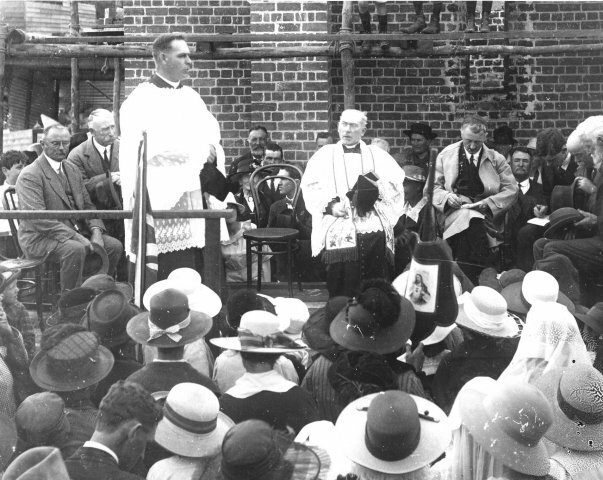 Rev Arch Deacon Smythe addressing parishioners after the opening ceremony (1921)The foundation stone of St Patrick’s was laid in 1919. Its doors were opened to the local community just two years later. Some of the older parishioners still recall how local limestone rocks were carried up from the beach on bullock trains, and how, as children, they carried bricks, two at a time, for the exterior works. Others speak of stories they heard from their parents and grandparents about their part in building the Cathedral. Other Bunbury residents again, as well as people from other South West areas, recall watching the Cathedral being built. Bunbury and its surrounding areas are not immune to the pains of modern living, such as domestic violence, drug abuse, a rising road toll. Without the Cathedral, the services the Diocese provides to many thousands of people in Bunbury, and throughout the South West of Australia, would be quantitatively and qualitatively poorer.